The issue seemed simple enough: Find a photo of a green landscape with a clean blue sky, add the company’s logo and tagline and post it on the homepage of the site. Sure, they could easily find an inexpensive photo that matched their need but after that, emptiness. For a small company with no in-house graphic designer, no access to any editing tool and no one who really knows anything about it, a simple job became an expensive nightmare. As stock photo companies expand their reach to non-professional image buyers, those in the very vast pool of SMB ( Small and Medium Businesses), this is an experience they see repeated over and over again. While they have greatly facilitated access to stock imagery, via extensive choices and reachable pricing, they’ve also opened up the door to wide-ranging frustration amongst their clients: How to get from concept to product in the most seamless way. Some start-ups have taken advantage of the big stock photo companies unresponsiveness to this issue and have built lucrative businesses around solving it. 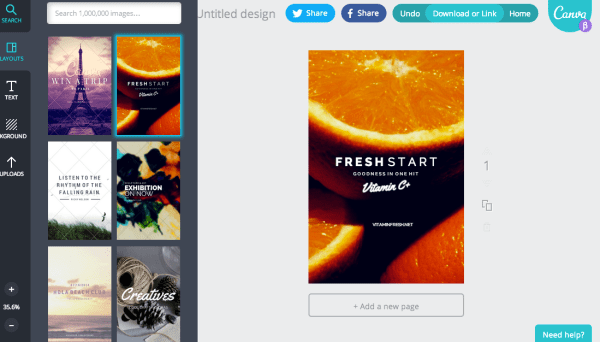 Australian based Canva, for example, has flipped the problem upside down, letting you create your final product online before committing to buying the right image. When customers hit the cash register, they download a 100% finished project they can immediately use. Using cleverly designed UI ( User Interface), they hand hold their clients through the creative process, making sure that even the most inexperienced individual can come out with a satisfying result. On the West coast of the USA, another company, Placeit.net, allows for anyone to easily insert a screenshot of their app or website inside a stock photo of mobile/tablet/laptop/TV by just uploading it or even simpler, inserting the URL. Everything else is done automatically, fitting the angle, lighting and composition of the original stock image. A few simple click, and it’s done. Here again, the client comes out with a fully finished creation they can use immediately. 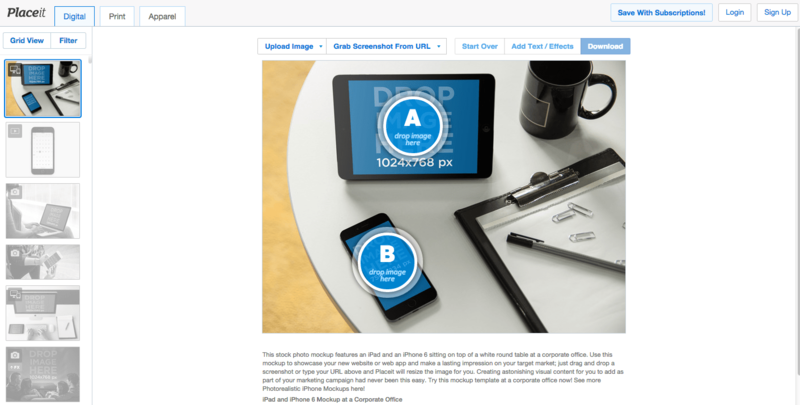 Both companies treat the stock image as a secondary product in the process, making sure that their customers can reach their desired finished product first. It is not stock imagery they sell (well, not directly), but rather what you can do with it. It is 100% success oriented. We call it “value added stock photography”. The time where being a simple stock photo agency just offering thousands, if not millions of images, is over. While certainly of use for large enterprise buyers, it is becoming ill-fitted to the modern landscape. Already we have seen, and will keep on seeing, large players like Shutterstock, Adobe, or Getty, making their content available within third-party software via their api’s. Instead of forcing customers to drop what they are doing to come to them to purchase a photo, they make their collections available at the point of decision. For example, if I am building a website via wordpress.com, I can easily license and use a photo without ever leaving the editor. Adobe, with the acquisition of Fotolia, and its subsequent seamless integration in its suite of software is another great example. Or Shutterstock and its deal with Facebook. But workflow integration, while certainly a decisive step forward, it is still not enough. The great majority of image usage involves some type of manipulation after it has been purchased from a stock agency. Some, like editorial, are minimal (cropping, resizing) while others involve adding and placing elements like text or other images. Nothing that a good online editor cannot handle. In fact, Shutterstock has started experimenting with its own version, still very basic for now (resizing and filters only). But the next step will be to offer the full scope of editing choices to empower customers to fully rework images. So that they can close the loop on the experience and leave with something they can use. The reason this is crucial is because most buyers do not see stock photography the same way as stock houses. Buyers think in term of finished product. I need to create a banner, or I need to do an email campaign, or I need to announce my 50% sale. In other words, they have a final goal in mind. Stock houses will only sell them an image for that project. They think in terms of selling parts. Here is an image, go somewhere to go add some text, crop it and resize it. Bye. While customers need a car, they sell them an empty chassis. If they do not want to lose customers to the Canva or Placeit of the world, stock photo agencies need to start offering the same service. By giving them the complete set of tools that will bring them from finding the image to the finished product, they transform each experience into a success. Not only they will find that they will satisfy a lot of their current customers needs but, as well, attract many new ones who were previously turned off by the complexity of the process. Vipul Bhatnagar liked this on Facebook. Rick Leckrone liked this on Facebook. Marco Venturini Autieri liked this on Facebook.